We searched Pubmed for peer-reviewed articles reporting on the association between alcohol use and Alzheimer’s disease (AD) incidence in cohort or nested case-control studies. 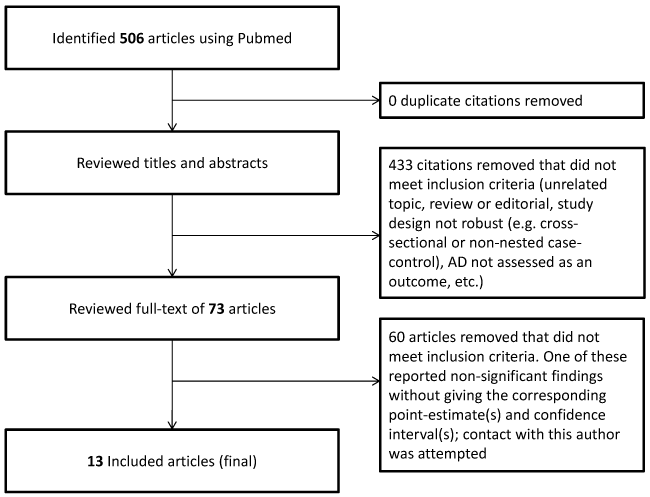 The search returned 506 unique citations that, after title and abstract review against our inclusion criteria, were narrowed down to 73 citations for full-text review (all published in English). Of these, 13 fully met criteria for inclusion in our summary tables. Among the excluded was one article that mentioned results that did not reach statistical significance but did not provide point-estimate(s) or 95% confidence intervals. Among the included were four articles based on data from the same underlying cohorts. We review such duplicate articles on a case-by-case basis, and select the most informative article(s) based on sample size, follow-up time, exposure assessment or modeling, and appropriateness of analytic methods. Please see our methods section for more detail on our general systematic review methods. We included both Deng 2006 and Zhou 2011 because they reported findings from alternate definitions of alcohol use and from different lengths of follow-up. Deng 2006 compared light-to-moderate drinking vs. non-use over 2-years of follow-up. In contrast, Zhou 2011 compared monthly, weekly, and daily use to occasional use over 5-years of follow-up. We included both Orgogozo 1997 and Larrieu 2004 because they reported findings for different lengths of follow-up. Orgogozo 1997 compared mild, moderate, and heavy wine consumption to non-consumption over 3 years of follow-up. Larrieu 2004 compared moderate and mild wine consumption to non-consumption over 8 years of follow-up. Deng J, Zhou DH, Li J, Wang YJ, Gao C, Chen M. A 2-year follow-up study of alcohol consumption and risk of dementia. Clin Neurol Neurosurg. 2006;108(4):378-83. Larrieu S, Letenneur L, Helmer C, Dartigues JF, Barberger-Gateau P. Nutritional factors and risk of incident dementia in the PAQUID longitudinal cohort. J Nutr Health Aging. 2004;8(3):150-4. Orgogozo JM, Dartigues JF, Lafont S, Letenneur L, Commenges D, Salamon R, Renaud S, Breteler MB. Wine consumption and dementia in the elderly: a prospective community study in the Bordeaux area. Rev Neurol. 1997;153(3):185-92. Zhou R, Deng J, Zhang M, Zhou HD, Wang YJ. Association between bone mineral density and the risk of Alzheimer's disease. J Alzheimers Dis. 2011;24(1):101-8.